The Copper River wild silver salmon season is here! The beautiful waters of Cordova, Alaska support one of the largest wild salmon runs on the planet. All three salmon species; Sockeye (Red), Chinook (King), and Coho (Silver), return to their spawning grounds every year to complete their life cycle. The Copper River Delta is home to the most sought after and arguably most delicious salmon in the world, and I am lucky to have fished these waters most of my life. Unfortunately, the Sockeye return earlier this season was the slimmest run in over fifty years. Watch for another update on this subject from the Eyak Preservation Council (EPC) soon. Each year I donate a portion of my catch to the EPC, a dedicated, effective wild salmon habitat and Native culture preservation non-profit organization which I founded in 1989 with my sister Pamela, shortly after the Exxon Valdez oil spill. EPC continues to do amazing work to protect the wild salmon and our wild salmon way of life. The threats are many, but we are working tirelessly to protect the ocean and land habitat in the Copper River watershed, Prince William Sound, and the Gulf of Alaska, for you and the wild salmon you love FOREVER. I am truly blessed to be able to fish here as my ancestors before me and hopefully my descendants will after me, long into the future. 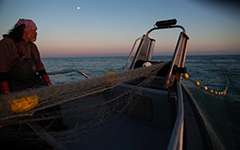 Every fish and all the seafoods we harvest from these sacred, pristine waters are honored and appreciated. Of course you can go to the nearest grocery store and find a mystery fish to eat. However, I guarantee that the salmon you receive from EPC is the best you will ever taste. The difference is in how we handle each fish with love for the absolute best quality and in our deep reverence and gratitude we offer to the salmon for its sacrifice to feed our friends and families. Want to know more and request some of our freshly caught Wild Silver Coho Salmon? Please conact Molly or Carol at the EPC Cordova Office at eyak@redzone.org or call: (907) 424-5890. All donations go directly towards helping to preserve and protect the amazing, thriving wild salmon of the Copper River Delta watershed. Keep watch for our newsletter discussing the 2018 salmon season, our campaigns and season updates including Northern Edge 2019, Shepard Point, Bering River Coal Conservation, Community Cold Storage, our Eyak Lake activities and more! Wild Salmon and Habitat Preservation work.